The bargaining committee included (from left) Raffi DerGhazarian, Happy Pharwaha, Justin Ling, Maggie McCaw, Deb Hong and CMG staff representative Federico Carvajal. 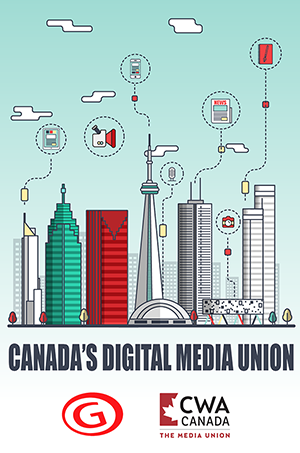 The first digital media company to be unionized in Canada now has a collective agreement in place that gives workers major gains in salaries and benefits, stronger equity provisions and measures to protect editorial independence. It is a first contract for the 170 VICE employees across the country, who joined CWA Canada’s largest Local, the Canadian Media Guild (CMG), last June. The members, who work in editorial, production, ad agency, post production and building operations, voted 94.7 per cent in favour of ratifying the three-year tentative agreement. The deal between the CMG and the global digital media giant was reached after nine months of intense negotiations and was tentatively agreed on March 31. The company ratified the deal on Friday. It is retroactive to Jan. 1. Employees will see immediate wage increases ranging from two per cent to 52.5 per cent based on the negotiated salary grid, with an average increase of nine per cent. There are annual increases of 2.0 per cent this year and 2.5 per cent in both 2018 and 2019. The collective agreement builds in pay equity provisions, guards editorial independence, increases vacation, doubles the number of paid sick days, improves parental leave benefits, strengthens protections for contract employees, defends the right to do outside work, improves severance, and establishes fair arbitration and dispute resolution procedures. CMG President Kamala Rao congratulated members for their determination and focus on tangible results that will improve their lives, both at work and beyond. 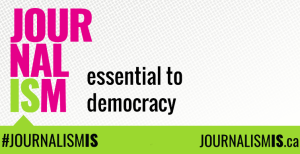 “CMG members at VICE have done what is required to make the improvements they deserve. They’ve pulled together in a union, our union, to strengthen their voices at work,” Rao said. CMG worked with VICE and an outside pay equity consultant to review the compensation structure and make recommended individual adjustments which are being implemented as a result of this study. As a part of the new agreement, the CMG and VICE will continue to do periodic, proactive assessments to ensure pay equity is maintained.